Massive investor exodus from risky assets is expected to continue into Thursday’s session, pushing stocks further down. Increasing strain in Spanish banking became the trigger for a sell-off Wednesday, investors concerned about the domino effect. Russian stocks plunged into the red Wednesday. The RTS dropped 2.54% to 1 273.83, with the MICEX losing 1.42% to 1, 308.30. The yield on Spain's 10-year bonds, a key indicator of market confidence in the country's ability to continue to make payments on its debt, shot as high as 6.69% – the highest since the euro currency was launched in 2002. Wall Street, which woke up to increased anxiety over higher Spanish borrowing rates, was down from the opening bell. The Dow closed down or 1.3%, at 12,419.86. The Dow has had a miserable May, losing more than 6%, and is on track for its first losing month since September. 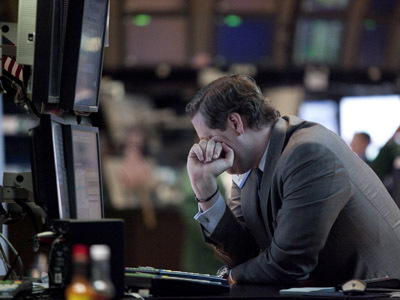 The Standard & Poor's 500 index lost 19.10 points to 1,313.32. 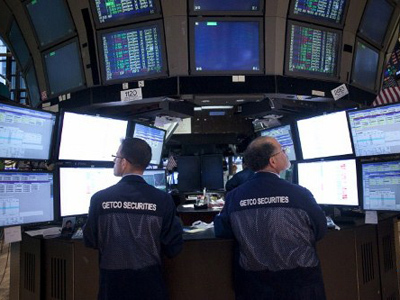 The Nasdaq composite index fell 33.63 to 2,837.36. Energy stocks were hit hardest because of a big drop in the price of oil, but stocks in all major industries fell. Crude oil lost more than $3 to below $88 a barrel. Crude has been falling steadily since the beginning of May, when it traded as high as $106 a barrel. If Europe's financial crisis plunges it into a deep recession, global economic growth will likely falter, reducing demand for commodities and machines that power growth. Fearing that outcome, traders pushed the stocks of heavy equipment maker Caterpillar and aluminum company Alcoa to among the biggest declines of the 30 companies that make up the Dow. Until the Greek elections next month, things will be too uncertain for the US market to sustain a meaningful rally, said David Kelly, chief market strategist at JP Morgan Funds. An opinion poll in Greece showed that the far-left Syriza party is gaining support ahead of elections June 17. Syriza opposes the system of bailouts and sharp budget cuts that have kept Greece afloat, but also gutted its economy. If the party wins, Greece may be forced to abandon the euro currency. Uncertainty about the future of the currency union would likely boost borrowing costs across the region, threatening nations that have received bailouts, like Portugal, and those that might need them, like Italy. If Greece's leaders allow the bailouts to continue and European governments start spending to spur growth, Kelly expects the market eventually to rise. If Syriza wins and Greece is expelled from the eurozone, he expects a volatile market for months. With Spain's banking system teetering and Greece's political future unclear ahead of crucial elections next month, European stocks lost even more. The euro dropped below US$1.24, to its lowest point since the summer of 2010. 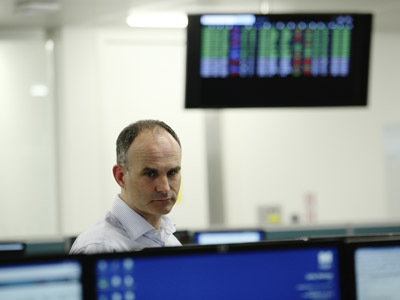 Britain's FTSE 100 fell 1.8%, the DAX in Germany lost 2% and France's CAC 40 plunged 2.2%. Intense demand for low-risk, easily tradable securities led investors to buy US government debt. When banks and big investors get frightened, they sell stocks of all countries and the bonds of countries in trouble. They buy Japanese yen, German bonds and especially US Treasuries. The yield on the 10-year Treasury note plunged to 1.61% from 1.74% late Tuesday. Wednesday's yield appeared to be the lowest since World War II, said Bill O'Donnell, head of US Treasury strategy at the Royal Bank of Scotland, citing data from the European Central Bank. Federal Reserve daily records only go back to 1962, and those reflect a previous record of 1.70%, set May 17. Yields on German government bonds, also seen as safe, turned lower, too. Concern about Europe was everywhere: The European Commission said consumer confidence fell sharply across the region last month. Spaniards withdrew money from their banks, a trend that could force more banks to demand government aid. 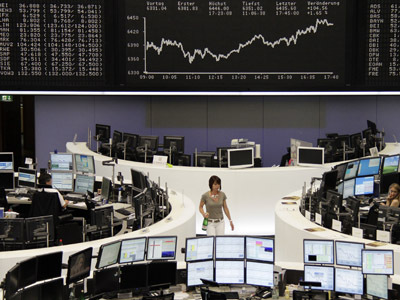 Fears about the domino effect of the Europe's debt crisis sent Asian stock markets lower Thursday. Japan's Nikkei 225 index tumbled 1.9%, also hit by a stronger yen which erodes the profits of the country's exporters. Mazda Motor Corp. plunged 5.8% and Canon Inc. fell 4.4%. Hong Kong's Hang Seng lost 1.4% to 18,423.61 and South Korea's Kospi was down 1.3% at 1,821.32. Australia's S&P/ASX 200 shed 1.1 % to 4,051. Benchmarks in Singapore, Taiwan, mainland China, Indonesia and the Philippines also fell. Amid the tumult, the European Commission called on the 17 countries that use the euro currency to create a “banking union” that can centrally oversee and, if needed, bail out national banks.